It’s December, and that means a lot of things to different people. For those of us in business, it means it’s a good time to look at the year that’s just passed. Time to work out what we did well, and what we can improve on for next year. Launching is hard. You create your product, you have all these grand aspirations for how many people you can help, and how much money you can make, and then it doesn’t live up to your expectations at all. When I launched Piece of Cake: 42 Simple Systems For Your Business in July, I sold one copy. Just one. Don’t get me wrong – I was grateful for that one sale – but when I’d set a goal to sell ten in the first week, it was a little disappointing. So what happened? The truth is, I didn’t know what I was doing. I thought I did, because I was copying what I saw other launches do, but it didn’t work all that well. Launching is easy when you have a system to work with. You’d think that having written an ebook about systems, I’d have a system for launching, but I didn’t. Didn’t have a clue. Then I heard about not one, but two launch programs, and decided that’s what I needed. I joined Bushra Azhar’s Sold Out Launch program. Bushra’s system is all about using psychology to get inside your customers’ heads. And that sounded really good to me, because I have a bit of an interest in psychology. Three months later, I can say THIS WOMAN HAS CHANGED MY LIFE. I launched my ebook again in November for about a week, and sold 4 copies this time! Which still didn’t hit my goal, but it’s an improvement on the first launch. Plus, I learned a lot of things that I can improve for the next launch (in January – head over here to get on the VIP wait list). Seriously, if you have a proven system, and follow it, you can do just about anything. I’ve got six – count ’em – SIX launches planned for 2018, including two new products, a refresh of an old one, and my first Black Friday sale! I’ve outgrown Mailchimp. It’s true that Mailchimp is a freaking awesome mail handler when you’re just getting started, because it costs nothing for ages. But there comes a time in every entrepreneur’s life when it’s time to move on from the free tools and upgrade to something better. And that’s where I’m at now. My list still isn’t huge, but I need extra functionality that Mailchimp just doesn’t offer. This is why I’ve made the switch to ConvertKit, which I might talk about in a future blog post. It IS possible to grow my business with small children. I had a baby at the end of last year, and I was afraid that would mean I wouldn’t have time to work with all the clients I’ve been working with. But guess what? In the last year since he was born, I’ve taken on six new clients – some for one-off jobs, others for ongoing work. I’m getting referrals all the time too. Plus, already this financial year (Australia’s fiscal year starts 1st July), I’ve met and surpassed my business’s income for the last two years. All during naptime and after bedtime! So that’s what I’ve learned this year! How about you? 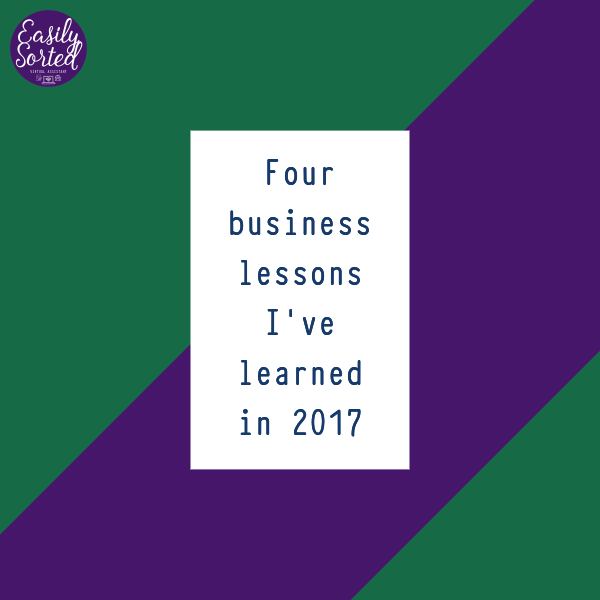 What business lessons did you learn? Pop them in a comment!